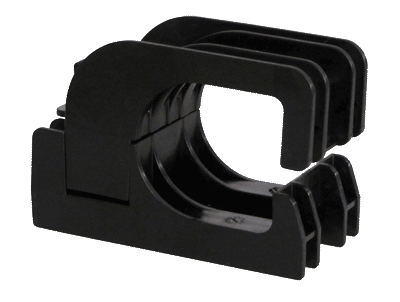 The S-5-S clamps are extraordinarily versatile clamps, specifically created for popular snap-together standing seam profiles. The S-5-S or S-5-S Mini can be used to avoid having to crimp-seam profiles such as Firestone UC4 and New Tech Machinery SS550 and SS675. They also accommodate horizontal seams where the horizontal projection is under 0.54 inches without the need to double fold the seam! Its simple design and ample size make it so strong and versatile it can be used with S-5!® snow retention products and other heavy-duty applications. 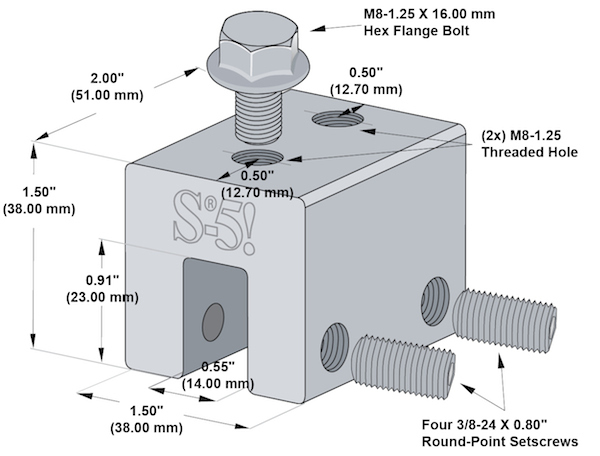 The S-5-S clamp has been tested for load-to-failure results on most major brands and profiles of standing seam roofing. The independent lab test data linked below can be used for load-critical designs and applications. S-5! holding strength is unmatched in the industry. 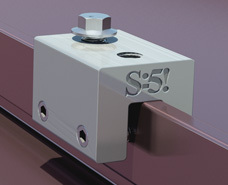 S-5-S clamps are each furnished with the hardware shown above. Each box also includes a bit tip for tightening setscrews using an electric screw gun. A structural aluminum attachment clamp, the S-5-S is compatible with most common metal roofing materials excluding copper. All included hardware is stainless steel.